With the death of Amarilla’s grandmother Mary Anne Delano Keller (3 August 1882) the land and estate of John and Mary was divided up and partitioned among the children and heirs. Amarilla and George Barclay were the Grantor’s along with others in the following partition deed. This is one of several deeds dividing up the land among the heirs of John and Mary Keller. It is the most significant to me because George and Amarilla Barclay (Barkley) are signees. The partition deed was dated December 14, 1883. It was recorded in the Index for Morrow County, Ohio deeds under the name of Charles P. Groves et. al. as Grantor and W.F. Keller et. al. the Grantee. The clerk’s copy was recorded in Vol. 37, pg. 594, FHL#388692. Below is a transcription of that deed and my best effort at reading the handwriting of the clerk. Charles T. Groves et. al. The East half of the North half of the North East Quarter of Section No. Eleven (11) Township No. Six (6) Range No. Fifteen (15). Also Twenty Three (23) acres of land of the East end of the South Half of the North East Quarter of Section No. Eleven (11) Township No. Six (6) Range No. Fifteen (15) Containing in all about sixty three (63) acres of land, more or less. To have and to hold said premises with all the _____ and appurtenances hereto belonging to the said William F. Keller and Ida C. Keller their heirs and assigns forever. In Witness Whereof, the said Charles T. Groves, Mary E. Groves, George Barkley, Amarilia Barkley, Henry F. Spracklin and Elizabeth Spracklin wife of said Henry F. Spracklin, who hereby relinquishes all their right of dower in the premises have hereunto set their hands and seals this 26th day of March in the year of our Lord one Thousand eight hundred and eighty four. In the presents of us ___Brown, J.R. Hanley Witness to signature of George Barkley and Amarilia Barkley – W.H. [Oelmahan], Rachel [Haileny], H.O. Danley. State of Iowa Muscatine County ss. Be it remembered that on this 26th day of March A.D. 1884 before me the subscriber Notary Public in and for said County personally came the hereinafter named Henry F. Spracklin and Elizabeth Spracklin his wife the Grantors in the above conveyance and acknowledge the Execution signing and sealing of the same to be their voluntary act and deed for the uses and purposes herein mentioned and the said Elizabeth Spracklin wife of the said Henry F. Spracklin being at the same time examined by me separate and apart from her said husband and the contents of said instrument being by me made known and explained to her then declared that she did voluntarily sign seal and acknowledge the same and that she is still satisfied herewith as her voluntary act and deed for the uses and purposes therein mentioned. In Testimony thereof, I have hereunto subscribed my name and affixed my Notarized Seal on the day and year last aforesaid. State of Minnesota County of Crow Wing ss. Be it Remembered that on the 11th day of April A.D. 1884 before me the subscriber a Notary Public in and for said County, personally appeared George Barkley, Amarilia Barkley his wife the Grantors in the above Conveyance and acknowledged the Execution Signing and Sealing of the same, to be their voluntary act and deed for the uses and purposes therein mentioned and the Said Amarilia Barkley wife of the Said George Barkley being at the same time examined by me Separate and apart from her said husband and the contents of said instrument being by me made known and explained to her then declared that she did voluntarily sign seal and acknowledge the same that she is still satisfied therewith is her voluntary act and deed for the uses and purposes therein mentioned. In Testimony thereof I have herewith subscribed my name and affirmed my seal on this day and year last aforesaid. State of Kansas,C ounty of Johnson ss. Be it Remembered that on this 28th day of April 1884 before me the subscriber a Notary Public in and for said County came the herein before named Charles T. Groves and Elizabeth Groves his wife the Grantors in the above conveyance and acknowledges the Execution Signing and Sealing of the same to be their voluntary act and deed for the uses and purposes therein mentioned and that the said Elizabeth Groves wife of the said Charles T. Groves being at the same time examined by me separate and apart from her said husband and the contents of said instrument being by me made known and explained to her then declared that she did voluntarily sign seal and acknowledge the same and that she is still satisfied therewith as her voluntary act and deed for the uses and purposes therein mentioned. In Testimony Whereof I have hereunto subscribed my name and affixed my Notarial seal on the day and year aforesaid. Deeds can be very helpful in pinpointing the residence of a person and their relationships. Henry Spracklin is the full brother of Amarilla. This deed is significant because it places Henry in Muscatine County, Iowa in 1884 with his wife Elizabeth. My cousin and I, were finding it difficult to track Henry once he left home after 1870. So this was great news to find this deed and discover where Henry was living. My cousin descends from this man so it was a great find. Amarilla and George Barclay are my great grandparents. This deed connects Amarilla to the Keller and Delano family. The Delano family is very old and goes back to Philip Delano of the 2nd boat to Plymouth 1620, the Fortune. Charles T. Groves and Elizabeth (Mary Elizabeth Helt) are descendants of Lovina Lavinia (Keller) Helt, daughter of Mary and John, and sister to Elizabeth Keller Spracklin. It places them in Johnson County, Kansas at this date. William F. Keller is the Grantee and Executor of his father John’s will. He is the younger brother to Lovina and Elizabeth and it places him in Morrow County, Ohio at this date. 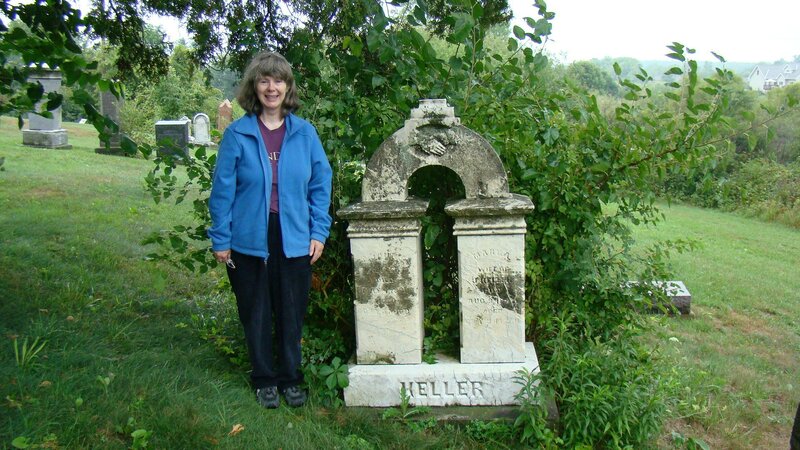 Recently I traveled to both Massachusetts and Ohio to dig into the research on Amarilla’s forebears and created another blog that will in more depth the Delano, Keller, Spracklin and Goss connections in Amarilla’s ancestral past. It is too complicated and large for this Barclay blog. This blog’s focus was on Amarilla’s and George’s life with references to her connections to these families. That blog is titled “Solomon Goss of Fearing Township in Ohio.” http://sgossfamily.wordpress.com/ I have placed a link under “Blogs I Like” to my other blogs.